Details: Our Glo Germ Powder contains proven safe ingredients which simulate the presense of real germs, 5 micros in size. 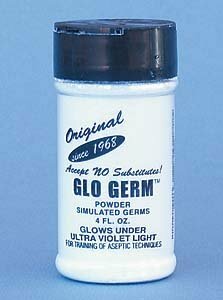 Glo Germ Powder will illuminate under UV light, showing where actual germs would reside. Our powder works best for demonstrating proper surface cleaning as well as the spread of germs, especially cross-contamination. Dust a very small amount of powder to a surface, or apply the powder with our Glo-Brush Applicator.